1. Preheat the oven to 200°C, gas mark 6 and grease 4 x 250ml ramekins or soufflé dishes with the melted butter. Then make the apple purée. Peel and finely dice the apple, put into a small saucepan with the Calvados, lemon juice, sugar and 3 tbsp water and bring to the boil. Turn the heat down and simmer for 10 minutes until completely soft. 2. Whisk together 150ml of the custard and cornflour, stir into the apple purée and cook for couple of minutes until thickened. Tip into a large bowl and leave to cool. 3. Whisk the egg whites to stiff peaks then fold into the cooled apple mixture. Carefully spoon into the ramekins and flatten the tops with a palette knife. Place on a baking tray and bake for 15 minutes until risen and golden. 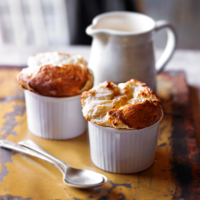 Serve the soufflés with the remaining cold custard. This recipe was first published in Wed Sep 03 08:07:00 BST 2014.